Dorothy Pelanda, director of the Ohio Department of Agriculture, meets Perry Township residents and trustees during a informal meet and greet event at Perry Township Administrative Building on Friday. 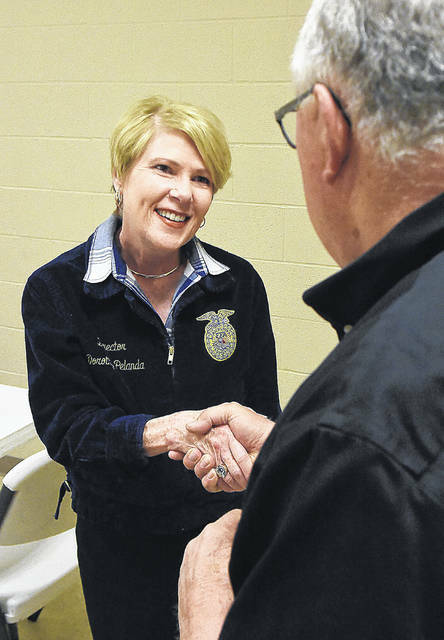 PERRY TOWNSHIP — Director of the Ohio Department of Agriculture, Dorothy Pelanda, concluded a series of meet and greets across the state in Perry Township Friday to discuss her budget plan to improving water quality and farm management. Pelanda’s budget, which would be set at $30 million if approved, is part of Governor Mike DeWine’s $900 million initiative, H2Ohio, that is aimed at improving overall water quality. Pelanda’s initiatives with the budget, which she presented to DeWine this week, involve making soil tests and nutrient management plans more accessible to farmers. If passed, the funds would be issued July 1. “We truly believe that engaging in soil testing that you understand the story your farm is telling you about each acre and engaging in a nutrient management plan that’s going to help you better define what each of your acres needs, and making it manageable and affordable, is key to moving forward,” she explained. Pelanda shared that she is currently working on an online program for nutrient management and also improving soil testing. Pelanda admitted the results of her initiatives may not be seen at the end of the year, but part of her process involves managing those expectations. “My monies are a little bit unique because the things as far as we’re going to do to use that money … are not going to be readily seen, certainly in the first year. The key is managing the public’s expectations about what they can expect a year from now, or even five years from now, about changing in our water quality and in our soil testing,” Pelanda explained.